Candy Addict » Wrigley Trivia Contest – win free gum and mints! Good news Candy Addicts! Our friends over at Wrigley are showing the holiday spirit and want to share some of their great products with Candy Addict readers! We’ve decided to have a Wrigley Trivia Contest to determine who gets the free goods! There will be 5 winners, each will receive 3 Wrigley Heritage Tins (Juicy Fruit, Doublemint and Spearmint) and 3 Life Savers Orn-o-mints (in red, green and blue). The first person to submit the correct answers will win one prize pack and the other four winners will be randomly chosen from all correct winners. Wrigley’s Heritage Tins are decorated as your favorite Wrigley’s flavor, Doublemint(r), Spearmint(r) or Juicy Fruit(r) and contain (12) five-stick packs of gum; four of each of these well loved brands. The vintage inspired tins fit wonderfully in a stocking or add flavor to any holiday coffee table or countertop. Post holidays when the gum has been chewed, the tins can be re-used to organize and store small household or office items. Life Savers Orn-o-Mints are the perfect holiday gift or entertaining accent and are filled with iconic Life Savers candy. 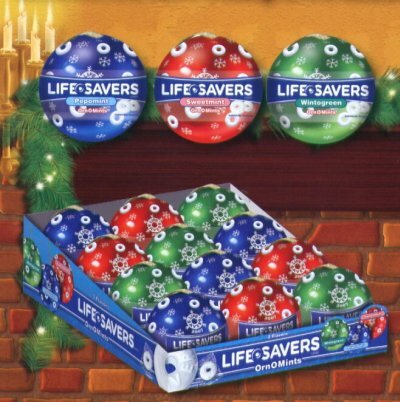 When decorating a tree or your home for the holiday, Life Savers Orn-o-Mints are a perfect compliment. Available in three colors, blue, red and green, the ball shaped “orn-o-mints” are a fun edition to any holiday setting. They can also be used to spice up any holiday gift when tucked next to a gift tag. Ok, you’re ready to find out how to enter and win, right? First, make sure you are a registered Candy Addict (this helps weed out the spammers and the Candy Addict poseurs). Now, take the trivia quiz and you should get 7 answers. You MUST follow these instructions to the letter – I will set up a filter that tosses any entry that doesn’t follow these instructions, so you could fail to be entered to win even if you have the right answers. Ok, enough rules, on to the questions. These are tough ones too. They even consulted the Wrigley Librarian (seriously) to come up with these questions. UPDATE: NOBODY got all of the questions correct! Which of these Wrigley brands is the oldest? What does the â€œPâ€ and â€œKâ€ stand for in P.K. gum? What famous cowboy was featured in Wrigleyâ€™s advertising during the 1940â€™s? When Wrigleyâ€™s brands were reintroduced during World War II, which brand had a new packaging design? One entry per person. Giveaway limited to residents of the U.S. Winner must be 18 years of age or older. Void where prohibited. Winners will be notified by email. Not responsible for lost, misdirected, or unread email. Entries must be received no later than midnight EST December 31, 2007. So, I definitely must be missing something, but darn if that “talky tyre” thing isn’t impossible to find…Darn you Wrigley historian!!! oops…Darn you Wrigley librarian! No offense, Wrigley historian. Did you know Wrigley’s once had one of the largest neon billboards in Times Square, until they donated the space for the sale of war bonds? How about the Wrigley’s spearmen? Wait, where you going? Remember the wrapper! No, come back just one more. Orbit gum name was originally introduced during WWII?